Offering you a complete choice of products which include hair care kali mehndi. It is a henna based powder hair dye for coloring gray hair in black. 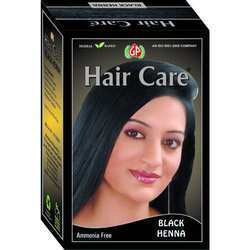 It is India’s largest selling henna based powder hair dye. It has a very small content of chemical, which is less then 3 percent after dilution. Its color stays on hair for 20-25 days. It is available in 10 gms consumer packing. Make there hairs shiny, silky and natural.